The Shelter is a big operation, and from the first row of pens being erected in 1995 we have grown hugely. We now have seven rows of ‘enclosed’ pens, one of which is custom designed to be more suitable for mum cats and kittens, plus a large ‘Open Pen’ area. One of our pens is affectionately designated our “Cat Borstal Pen” and this hosts some of our more challenging individuals, who need a bit more time and care to settle into the shelter and/or who need a bit more time to rebuild their trust of humans. a ‘top box’ – a heated area with toasty bed and feeding zone, as well as a separate shelf with comfy pillow. Four of our enclosed pens have secure rear areas. This allows us to give controlled access to those feline guests who for various reasons – often an aversion to other felines – are not able to have a ground-pass. Our Open Pen is the purrfect place for some of our longer term residents, our feral guests and those cats who find being in an enclosed pen too stressful. These cats are extra lucky – as well as having somewhere safe and secure to sleep with a regular supply of fresh food and water, they also have a ground-pass and so benefit from unsupervised outdoor time. Over the years we’ve worked hard to develop the grounds to be a place of tranquility for both cats and human visitors alike. 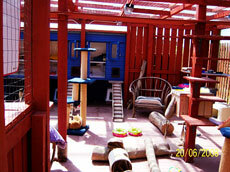 Along with heated top-box areas, the Open Pen contains numerous beds and hidey-holes, activity scratch posts and plenty of toys to keep the residents entertained. 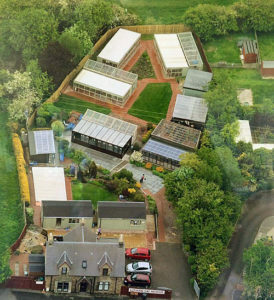 We have two purpose built buildings near the entrance to the shelter. One is used as an office, where the Wardens work away organizing the comings and goings of our feline residents. The other building is our very busy kitchen and food preparation zone. We also have a section of the site house which is used for some of the “oldies” in our care – a toastier and cosier place you couldn’t hope to find! There is always ongoing activity for maintaining and upgrading the facilities and grounds at our shelter, all of which is funded thanks to the generosity of the public.